ADyno Results (Mustang Dyno): Pump Gas Before 372hp / 356tq @ wheels (10psi) After: 548hp / 540tq @ wheels (19psi) Net Gains: 176hp / 184tq @ wheels That is a huge power gain. The old rule of thumb is 10hp is about 0.1 seconds in the quarter mile. It should make this car fairly capable in a quarter mile. 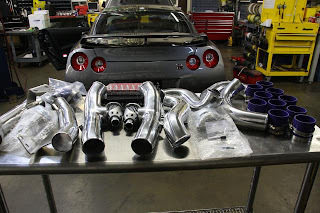 HKS R35 GT-R Parts on ebay. There are some sweet high powered GTR's roaming around! I love it...I can't wait till Jotech really sinks its teeth into a GTR....they have a Evo 9 with 645 hp!